Secretary of State Mike Pompeo testifying Wednesday before the Senate Foreign Relations Committee. Mike Pompeo, the secretary of state, told skeptical senators on Wednesday that the Trump administration has taken a truckload of punitive actions against Moscow as “proof” it is tough on Russia as the White House walked back an invitation for President Vladimir V. Putin to visit Washington this fall. Yet during a combative three-hour Senate hearing, Mr. Pompeo repeatedly declined to provide specifics about a one-on-one meeting between President Trump and Mr. Putin last week in Helsinki, Finland — including the possibility of relaxing sanctions on Moscow, military cooperation in Syria or the future of Crimea. Mr. Pompeo angrily dismissed questions about the deep gulf between the administration’s tough policies on Russia and Mr. Trump’s own warm statements about Mr. Putin. And for the first time, Mr. Pompeo acknowledged that North Korea is continuing to produce nuclear fuel for its weapons program, even as the administration claims progress toward the goal of denuclearization. “Yes, they continue to produce fissile material,” he told the committee, using the term for nuclear material that can be used in a bomb. His testimony amounted to an elaborate cleanup effort by the United States’ top diplomat for Mr. Trump’s performance in Helsinki, during which he cast doubt on his own intelligence community’s conclusion that Russia had interfered in the 2016 presidential election. The meeting with Mr. Putin was followed by a week of halfhearted walk-backs and position shifts that have left many lawmakers questioning Mr. Trump’s ability to be tough with Russia. At times, he dismissed Democratic senators’ attempts to elicit answers as politically motivated. “I understand the game that you’re playing,” he told Senator Bob Menendez, of New Jersey, the panel’s top Democrat. “If President Obama did what President Trump did in Helsinki, I’d be peeling you off the Capitol ceiling,” Mr. Menendez said later. The criticism came from both parties. Senator Bob Corker, Republican of Tennessee and the chairman of the committee, opened the session saying that Mr. Trump had been “submissive and deferential” to Mr. Putin in Helsinki, and derided the administration’s foreign policy as an incoherent “ready, fire, aim” approach. “It’s the president’s actions that create tremendous distrust in our nation, among our allies — it’s palpable,” Mr. Corker said at one point. In one testy exchange with Senator Tom Udall, Democrat of New Mexico, Mr. Pompeo began reciting a litany of actions the administration has taken against Moscow, offering to send a full list to the committee as “proof” — including imposing sanctions, expelling diplomats, closing a consulate and providing weapons to Ukraine, where the military is fighting Russian-backed separatists. “We’ll back a truck up and get it on in here,” Mr. Pompeo said with a glare. Russian officials had not yet committed to the invitation. Mr. Menendez told Mr. Pompeo that American citizens and their elected officials have heard more about what happened in the closed-door Helsinki meeting from Moscow than from their own president. “We don’t know what the truth is, because nobody else was in the room where it happened,” Mr. Menendez said. “I know — I briefed him on it for over a year,” Mr. Pompeo said, referring to his time as C.I.A. director. He insisted Mr. Trump deeply respects the work of the intelligence community — a notion the president left in doubt in Helsinki when he said he had to weigh its assertions about election interference against Mr. Putin’s strong denials that it took place. 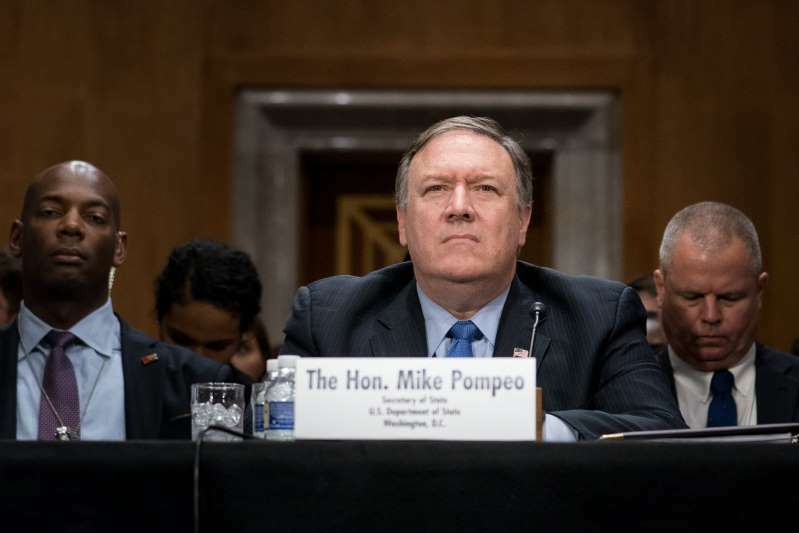 Mr. Pompeo spent much of the hearing attempting to persuade senators it that it was the Trump administration’s policies — not the president’s own words — that mattered. At times, under questioning from the lawmakers, that meant the secretary of state contradicted Mr. Trump. That was the case when it came to Mr. Trump’s frequent complaints that NATO allies have been delinquent in paying their bills to the United States — a mischaracterization that Mr. Corker called out. Mr. Pompeo agreed. “That’s correct,” he said. “That’s not exactly the question,” Ms. Shaheen responded. But he conceded that Mr. Trump’s words reflect United States policy. Mr. Pompeo’s decision to concede that American intelligence agencies believe North Korea is still producing nuclear fuel was significant. It runs counter to the narrative that Mr. Trump has been pressing, one in which the North is making good progress on its promises to him in the June summit meeting in Singapore. The acknowledgment of continued nuclear production suggests that even as the negotiations inch forward, the magnitude of the problem is increasing. For Kim Jong-un, the North Korean leader, the continued production of nuclear material may be a pressure tactic. The C.I.A. — which Mr. Pompeo headed last year — believes that Mr. Kim will never give up all of his nuclear capability, but may negotiate a reduction in parts of it.